This faded print (Pic 1) is one of the earliest photographs of collections in Mexico’s Museo Nacional, and not only documents a museum collection frozen in time, but also illustrates 19th century ideas about pre-Columbian art and cultures. I found the photograph in an album in the Getty Research Institute called Antiquités Américaines, that had belonged to the French collector and philanthropist Eugene Goupil. 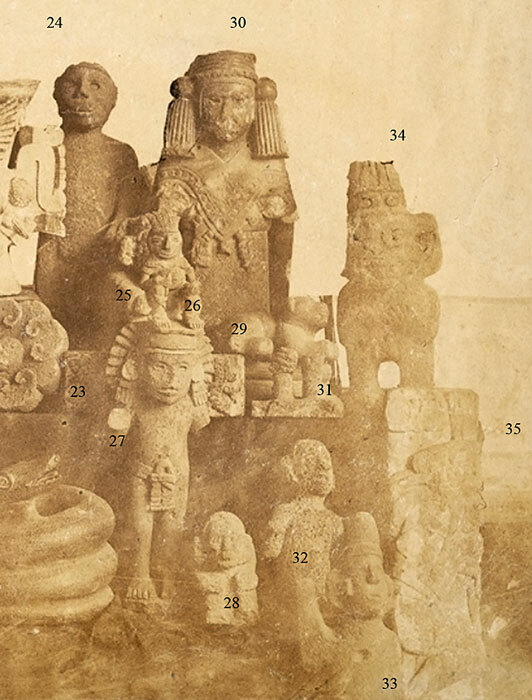 The photos in the album were collected by Eugene Boban, a French antiquities dealer, who lived in Mexico during the 1850s and 1860s, and again in the 1880s. 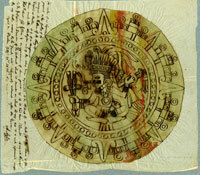 The album also includes photos of many other pre-Columbian artifacts, including objects collected and exhibited in Paris in 1867 by Boban, who was a member of the Commission Scientifique during the French intervention in Mexico, and advertised himself as antiquarian to Emperor Maximilian. I believe that Léon-Eugène Méhédin took this photograph for the French scientific commission between 1864 and 1867. Since Eugene Boban originally owned this photograph, I believe we can date it to a time between December 1865 and July 1866, when the Austrian emperor Maximilian moved the Museum from the University to the National Palace. Méhédin’s ‘artistic’ line-up includes well-known artifacts that are still in the Museo Nacional, including Aztec stone sculptures and ceramics, alongside a Mayan bas-relief carving. We can learn a great deal about the history of the National Museum’s collection, the sources of its acquisitions and the evolving knowledge of pre-Columbian art from the image, combined with other historical images and catalogue descriptions. We have divided the photograph roughly into thirds (Pix 2, 3 and 4), giving a chance to examine and comment on a few individual pieces. Number 6 (Pic 2) is one of two Tlaloc (rain god) sculptures shown. 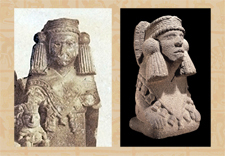 The second figure is found on the far right, number 34 (Pic 4), and has more typical rain god attributes, although the face of each is composed of a snake twisted around the eyes, nose and mouth, and each has their hands held close to the chest. 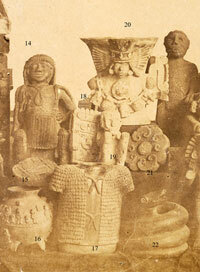 The photograph contains quite a number of fake pre-Columbian artifacts. In the 19th century, particularly this early in the century, very little actual scientific archaeology had been done in Mexico. But there was a lot of interest by collectors in obtaining artifacts. Mexico has always had many potters and carvers who are talented and productive. 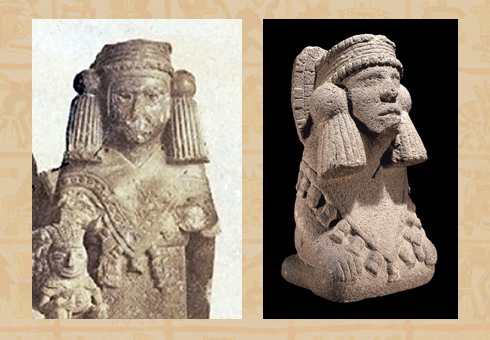 In the 19th century they tried to imitate the art of the ancient Aztecs, Toltec, Zapotecs and Maya. Since so little was known about these cultures, people were fooled by fakes that would no longer fool anyone these days. 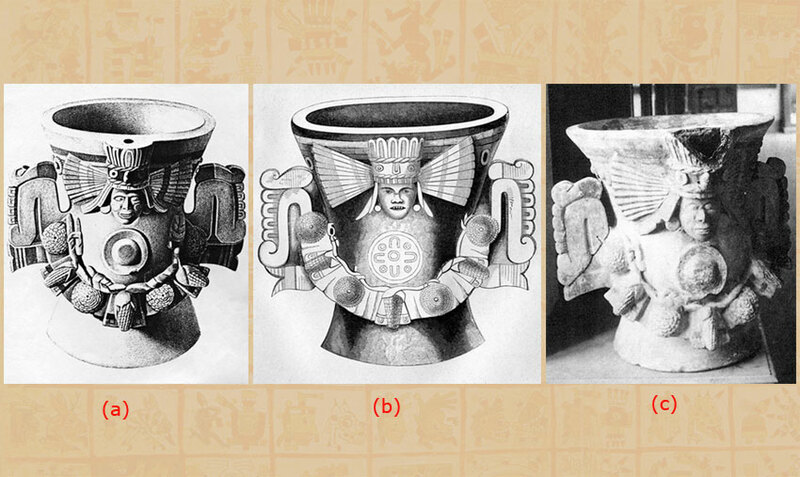 Some really good examples of these fakes are the large rounded vessels, number 7 on the left (Pic 2, close-up Pic 5), and 16 towards the centre of the photograph (Pic 3), and are typical for 19th century ceramic wares masquerading as pre-Columbian pottery. 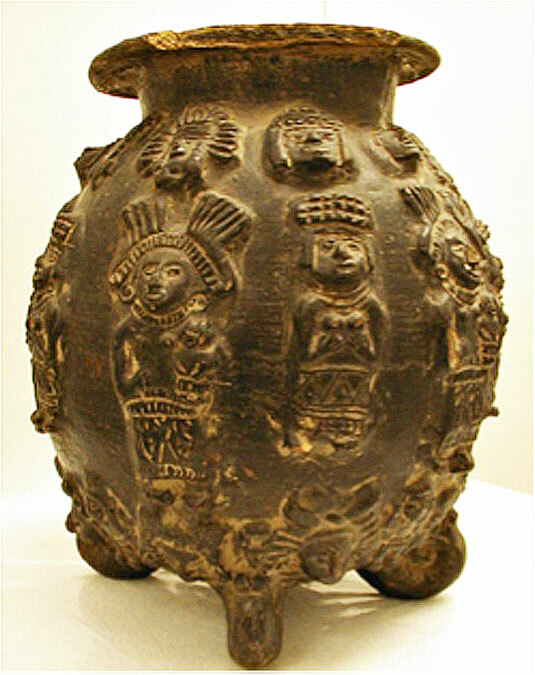 The vessels are large, quite thick-walled and heavy, often badly fired and covered with appliquéd figurines or heads, some may be from actual Aztec, or colonial period molds. 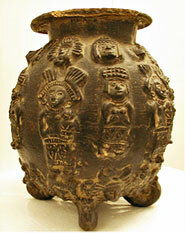 This particular type of vessel also helps to date the photograph. In a mid-1860s photo of Eugene Boban standing with his Mexican pre-Columbian artifact collection, later exhibited at the Exposition Universelle (Pic 6), we see at his right foot another one of these, apparently ubiquitous, black ware vessels. The stone figure, number 19, is probably also a piece made by a more modern carver in imitation of ‘Aztec’ sensibilities, and its present whereabouts are unknown. Numbers 15 and 21 are stone disks carved in bas-relief. The round shield is nearly identical to one housed in the Berlin Volkerkunde Museum, and exhibited in London in 2002. The carving is slightly different on the Berlin piece, which is also apparently somewhat smaller than this disk. The bas-relief with the floral design is probably from the façade of a building, and I believe is still in the Museo Nacional de Antropología. 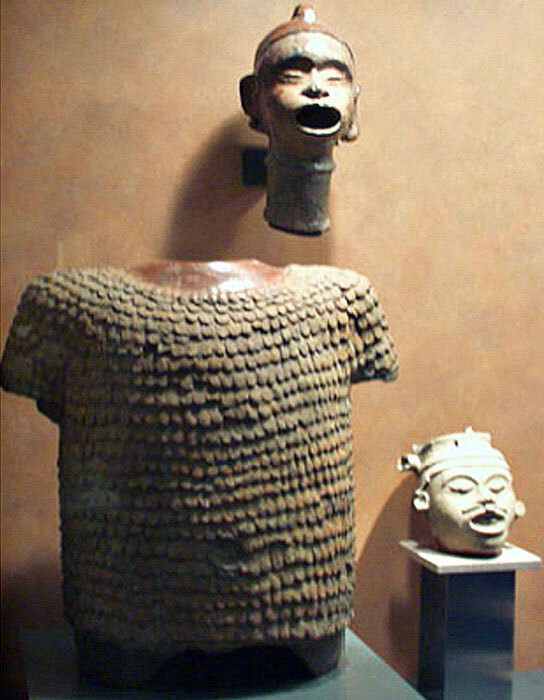 Number 17 is the back view of the ceramic torso of a Xipe figure that is on exhibition in the Museo Nacional to this day. A recent snapshot shows the front of this piece (Pic 8). 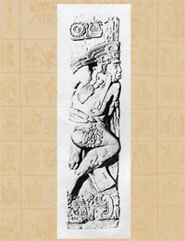 Maximilien Franck illustrated the carved stone representation of Chicomecóatl, number 18, in 1829. He described it as reddish sandstone, standing about 43cm. tall. The carving was then in the collection of Don José Mariano Sánchez y Mora, the Conde del Peñasco, who had a private museum. Franck also drew the large, ornately decorated, ceramic brazier, number 20, in 1829, describing the artifact as painted ‘al fresco’, on a sky-blue ground, with yellow, brown, red and white ornaments. ‘The corn’, he wrote, ‘was blue, yellow and red, the same as it is today. The antique was dug up in Santiago Tlatelolco’. This is one of two similar braziers depicted by Frank, both of which were in the private collection of the Marquesa de Silva Nevada when he drew them. 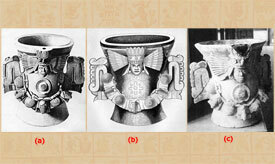 Brantz Mayer, who published ‘Mexico as it was and as it is’ in 1844, rendered a recognizable drawing of the brazier (b), after it had been acquired by the Museo Nacional. 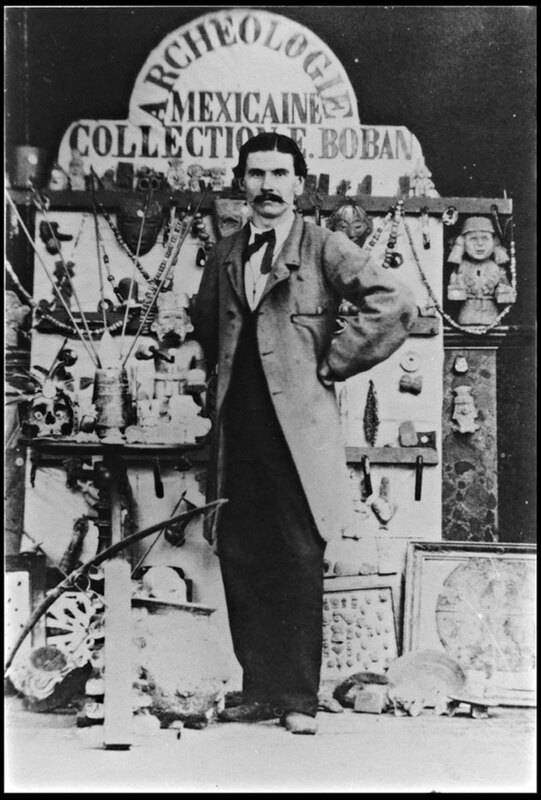 The Mayer drawing would seem to affirm the 1865 date of the photograph in Boban’s album, when we compare the brazier to other depictions. The two drawings, Franck’s and Mayer’s were done in 1829 and 1843 respectively, and when compared to an 1884 William Henry Jackson photograph (c), it is clear that by then the figure’s headdress has been substantially damaged, and missing a large piece. This is not the case in either of the drawings or the 1865 image. The broken element on the left side of the brazier, which is lying on the table in the 1865 photo, has been repaired in Jackson’s 1884 picture (Pic 9). The final, right-hand section of Méhédin’s photograph from the Boban/Goupil album displays a variety of well-known artifacts, which can still be seen in the National Museum. 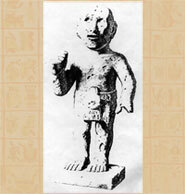 The male figure, number 24, is another Conde del Peñasco artifact drawn by Franck in 1828, and sold to the Museo Nacional around 1846 or 1848 (Pic 10). Number 26 is another 19th century black ware fake, made and sold in Tlatelolco. This figures seems to be holding a cigar, and is sitting indecorously, atop the head of a well known stone sculpture, number 27, which is identified by Esther Pasztory as a ‘young god with fan headdress’. This sculpture is also still in the collection of the Museo Nacional. I have not been able to securely identify numbers 28, 31, 32 and 33, but perhaps others reading this article and viewing this photograph may recognize them. I believe that number 29 (Pic 12) is an animal sculpture depicted by Franck as part of the Peñasco collection. He described it as a ‘reclining dog, leaning on one paw, with two feet gathered up and the tail on the loin... a third [of a meter] and an inch long.’ The drawing depicts the animal from the opposite side, although I believe that we are seeing the same figure. He’s set upon some other artifact, or perhaps a wooden stand. 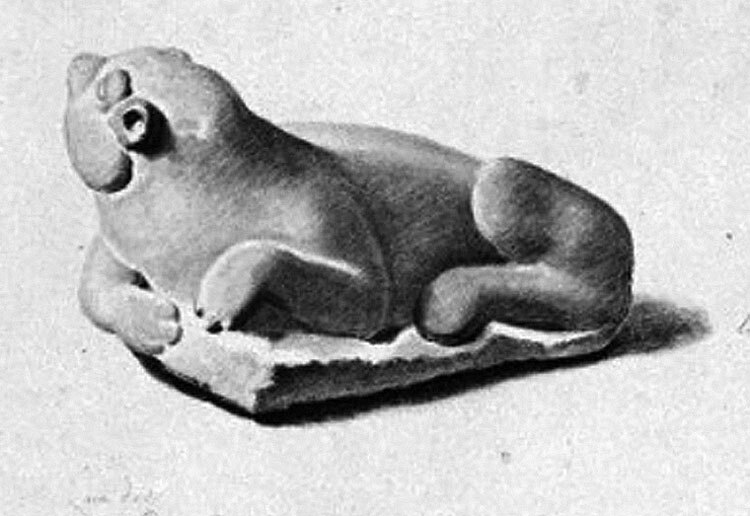 Another stone figure is set in front of him, but it isn’t possible to determine what this is. The Tlaloc sculpture, number 34, was described earlier. 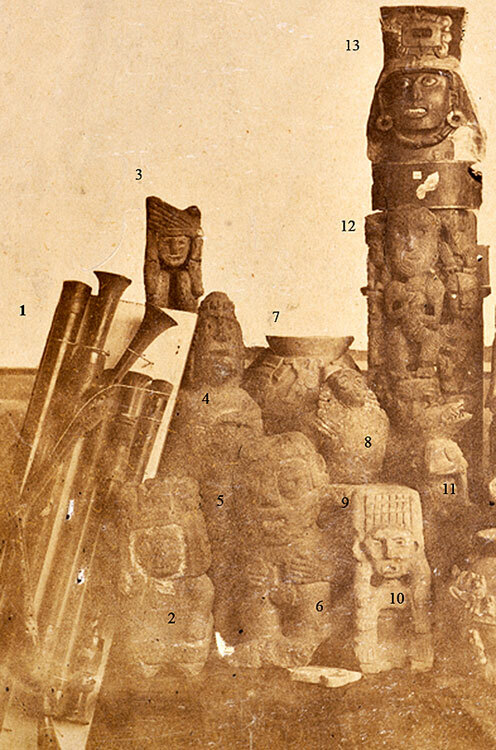 The artifacts prized by the Museo Nacional in the middle of the 19th century, and arranged for the photograph by Léon-Eugène Médéhin of Maximilian’s Commission Scientifique included one object discovered in 1824, and several that formed part of that collection from at least as early as 1828 only three years after the museum’s founding. Their presence at the collection’s formation is documented by Maximilien Franck’s superb drawings which are now in the British Museum. Other artifacts drawn by Franck in 1828 and 29 were part of two private collections, that of the Conde del Peñasco and the Marquesa de Silva Nevada. We know that the Conde’s collection was purchased by the Museum just before 1848, and the Silva Nevada objects were donated or sold between 1830 and 1843, when Brantz Mayer first saw them. What is perhaps most surprising about the photograph is that nearly a third of the objects are 19th-century fakes, and have since been removed from exhibition, if not from the collection itself. The fact that they were still exhibited in the 1880s is documented by their descriptions in the Mendoza and Sanchez museum catalogue of 1882, the Blake translation of the catalogue and the Jackson photographs (both 1884). I would suspect that they may have been removed after W.H. Holmes wrote about ‘Spurious Mexican Artifacts’ citing specific Museo Nacional objects then on exhibition. Méhédin’s large format photograph in Boban’s antiquities album documents a moment in the National Museum’s collecting and exhibiting. Like all museum collections, it has evolved over time, and this evolution reflects in a tangible way the knowledge and expertise of each succeeding generation of curators and scholars. There were very few fakes in the collection before the 1830s, which can be seen in the Maximilien Franck drawings. 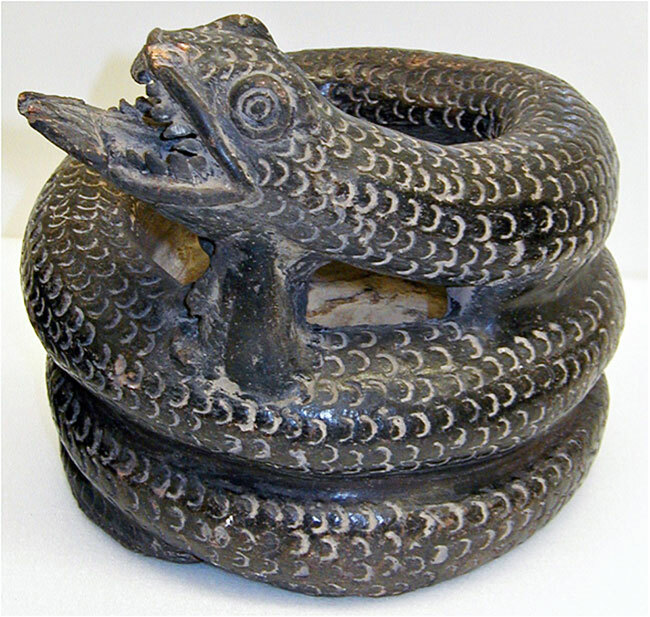 At some point during the subsequent thirty-five years, however, at least ten fake artifacts were acquired by the National Museum, and, judging from the W.H. Jackson photos, there were many, many more by the 1880s. This suggests that the faking industry probably took off in earnest sometime between 1830 and 1860, and really gathered steam in the 1880s. Unlike more recently unmasked pretenders, the 19th-century black wares wouldn’t fool any student of pre-Columbian art of this century, but that is an indication of how far we’ve come, and how much more information we now possess. It should still give us pause. Fakes are always creatures of their time, going in and out of fashion as tastes and connoisseurship change and improve; those portrayed here are no exception. Ones that are not quite so obvious to us now will most certainly become so at some time in the not too distant future. Museum collections are one of the ways we organise knowledge and understanding about culture and history, our own and others’. The objects in those collections have stories to tell about their history, their collectors, and the intellectual and artistic sensibilities that assigned value and importance to them. Objects in collections are like books in a library, which can, and should, be read and re-read as more knowledge is available. In doing so, we expand and deepen that knowledge, and by cleaning house, getting rid of outdated notions, we move forward while re-evaluating our past. It may also help us reconnect our understanding of what we know with how and why we think we know it. I am indebted to the Getty Research Institute for allowing me access to the Boban album, to Elizabeth Carmichael for introducing me to the Maximilien Franck drawings, and to Jonathan King and Colin McEwan of the British Museum for access to the drawings. I also want to thank Pascal Riviale, Leonardo López Luján and Brett Topping for their comments and suggestions.